Rising steeply up from Lake Wakatipu, Whakaari Conservation Area is open high country which was mined for scheelite in the 1900s. Old pack tracks and bulldozed roads crisscross the hills and a few historic miners’ huts remain, three of which are available for overnight use. 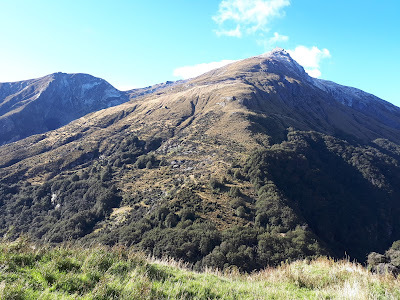 The Mt McIntosh Loop Track begins less than 2km from Glenorchy; there is no sign by the road, only a goat track leading up the hill immediately before the Buckler Burn bridge. Following the boundary fence and an old water race, the track skirts around to Chinamans Flat before climbing very steeply up the end of the spur to the transmitter. Being on the sheltered side of the range it was warm going despite the frost and sprinkling of snow underfoot. Once past the transmitter the going was much easier along the ridge on an old road to Long Gully Saddle. There are excellent views across Lake Wakatipu and down to Glenorchy, as well as up to Mt Earnslaw and the Dart Valley. Reaching the McIntosh Huts in 2:45 hours I stopped for lunch and drank in the gorgeous view. 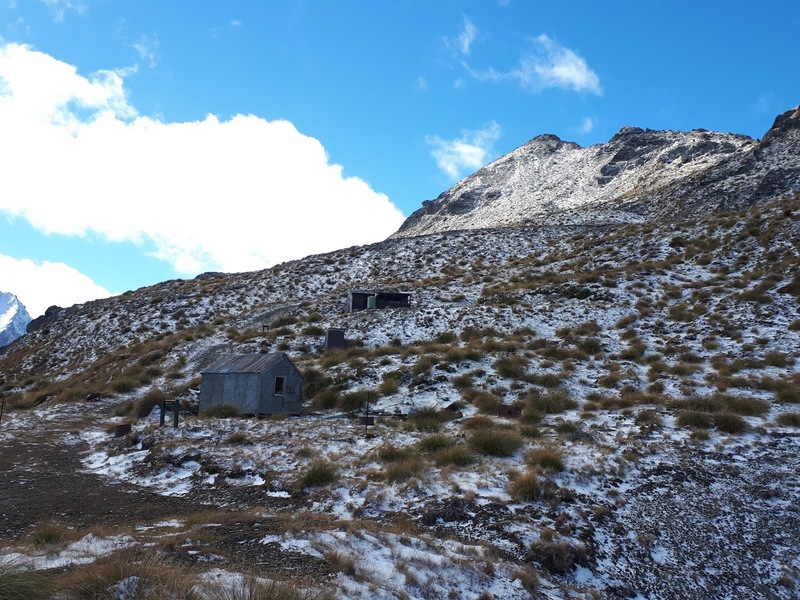 These huts are a couple of old miners’ huts, one of which has been restored and is a basic DOC hut although it is obviously not completely weather tight as there were small snow piles inside. Mt McIntosh (1701m) was beckoning from behind the huts so I decided to go for a scramble. With frozen scree and patches of thin snow on tussock and rock I had to be careful not to climb myself into something I couldn’t get out of. The breeze was rather keen on the summit otherwise I could have happily stayed up there for hours. Looking out to Black Peak, and further into the Richardson Mountains, I wanted to keep on exploring. Another day. On the descent I worked my way down the sunny side of the ridge where the scree was unfrozen and much safer going. Reluctantly leaving the McIntosh Huts I took a shortcut down an unmarked bulldozer trail instead of backtracking down to Long Gully Saddle. It was fun running down the old road, quickly dropping 800m to the Buckler Burn, with a brief stop to check out McIntyre’s Hut. 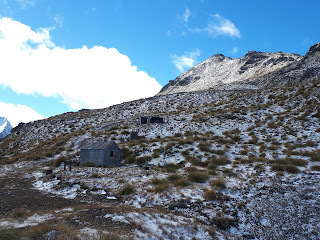 A short climb brought me on to the main Mt Judah Track and the final descent past the Glenorchy Scheelite battery back to the Whakaari car park. Looking back to Mt McIntosh (right) from the Mt Judah Track. The old bulldozer tracks are visible zigzagging down the face.